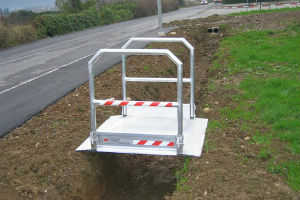 Designed mainly for use across excavations, our aluminium pedestrian walkways add safety and security to your work force or pedestrian user, taking a maximum loading capacity of 400kgs and range from 1260mm to 6060mm in length to fit into any works site. Buy vehicle gangways built from the best quality aluminium, for use with plant vehicles or industrial loading equipment – simple to set up and take down, these access gangways have a capacity of up to 4500kgs and can withstand frequent use. All our walkways for sale come with handrails on either side and fold in on themselves for easy transportation; they can also be removed completely to suit individual requirements. Please be aware these ramps are only suitable for use at a maximum gradient of up to 5%. You will also need to ensure that there is at least a 330mm rest on either side of the excavation for the access ramp to rest upon. Pedestrian walkways, access ramps and driveways have folding edges to reduce overall dimensions during transport. Minimum width of tracks is 200mm. Minimum footprint of rubber 200x200 mm. Maximum permitted distribution of load on axles 40%-60% (optimal is 50%-50%). At both sides of the walkway there must be a minimum rest/support of 330 mm. The max. gradient of 5% in the gangway’s inclination cannot be exceeded.